The natural fragrances you love repels the biting insects you hate without the use of harmful chemicals. Our natural blend of citronella, lemongrass, rosemary and other essential oils form a barrier between you and those pesky insects. 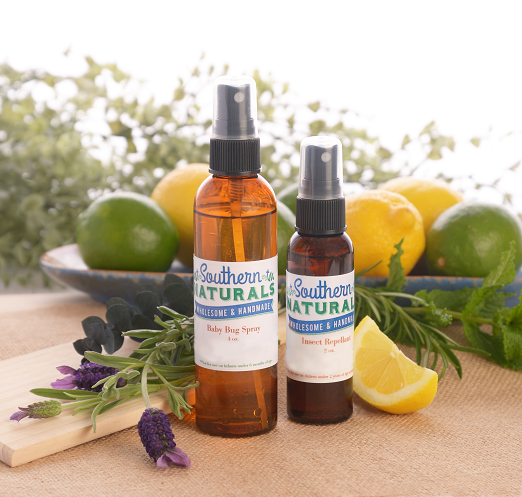 Southern Naturals Insect Repellent also serves as a soothing after-bite relief including bites from fire ant stings. It's no secret that mosquito bites can transfer a number of diseases to humans and animals. Before you whip out a can of mosquito-repelling spray you should know that many conventional brands contain DEET, a powerful pesticide that has been linked to a number of health problems such as skin rashes, dizziness, and even seizures. According to studies by researchers at Duke University, regular and prolonged exposure to DEET via topical application, especially when used together with other pesticides or chemicals, causes significant brain cell death and behavioral changes in laboratory rats. Rather than expose yourself to the toxic effects of DEET and other pesticides, I encourage you to try an all-natural formula made with essential plant oils that have been used for centuries all over the world to provide natural protection against biting pests. Not only does this natural formula repel the pesky little insects, its essential oils combine to create a pleasant fragrance. Directions: Shake well before applying. Apply on exposed skin as often as needed - about once every hour or two works well for most people. For added protection, spray on clothing as well but please note this formula does contain natural oils. Caution: Avoid contact with eyes and lips. Spray onto hands to apply to face and ears. Adults apply to children and don't apply to hands of children. Do not inhale. If irritation occurs, wash area with soap and water and discontinue use. Do not use on children under 2 years of age without consulting with a licensed physician.